Two men in high silk hats breathe the style of the times. The year is 1889. They are old enough to remember the century’s watershed event, the Civil War, which is long in the past, it being more than two decades since Appomattox. These gentlemen, and millions of others, have moved on. They are Gilded Age creatures, inhabitants of a rapidly modernizing society enjoying ever-increasing wealth. Their era was empty of historical grandeur: in that respect, the 1880s, with their intense but under-examined social problems (including widening economic inequality), were somewhat similar to today. Formally attired, but looking like they are often so, the two men smile into the camera of Uriah Hunt Painter. Painter and the man on the left may be engaged in a mutual photo-shoot, for each has a Kodak camera, a new invention that became the era’s most fashionable ‘toy.’ This picture captures how people had begun to use it—not too differently from how people use their cell phones now. 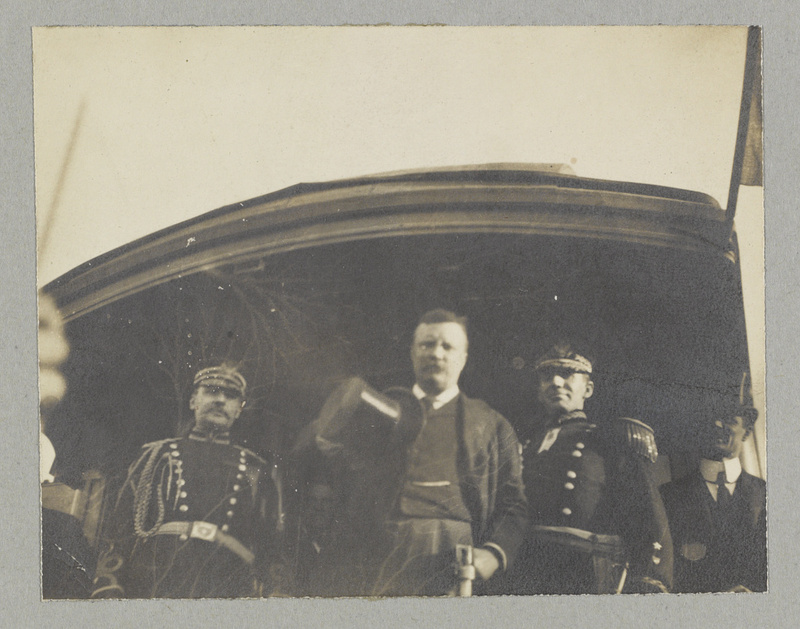 President Theodore Roosevelt, holding his top hat in one hand and flanked by two officers and an unidentified man, looks down at the photographer from the back of a railroad car. The year is 1903. The spontaneity of this picture registers how mainstream photography and photographic portraiture were changing in the wake of George Eastman’s revolutionary invention of the hand-held Kodak camera. By then the Kodak camera had been around for fifteen years, but its impact was still widening and generating change. Because the Kodak was not just a new type of camera, but a new type of film, and one that gave the user freedom from having to learn film processing, it made picture-taking easier for everybody. Amateurs began taking pictures like crazy. The Kodak process also represented a big leap forward in terms of stop-motion photography, suddenly endowing pictures of living subjects with greater immediacy. Those qualities shine in this marvelous photograph of President Theodore Roosevelt, taken during one of his myriad railway journeys. Who was the photographer? Was it a professional photographer assigned to cover him, or an ordinary American, perhaps even a woman, who successfully beseeched the President to pose just this one time? Did he even consent? His aides look amused, but Roosevelt himself looks positively put out. On the evening of March 4, 1901, men and women in formal dress began drifting in to the Pension Building to attend the inaugural ball for William McKinley, who had been sworn in to his second term as president earlier that day. The cavernous Great Hall of the Pension Building had been lavishly decorated for the occasion. Guests were nearly lost in its magnificence: the endless garlands of lights, the immense stretch of polished floor, the massive stone columns stretching up to a ceiling over a hundred feet high. Overhead a gold-draped canopy glowed, reflecting the elegant incandescence below. 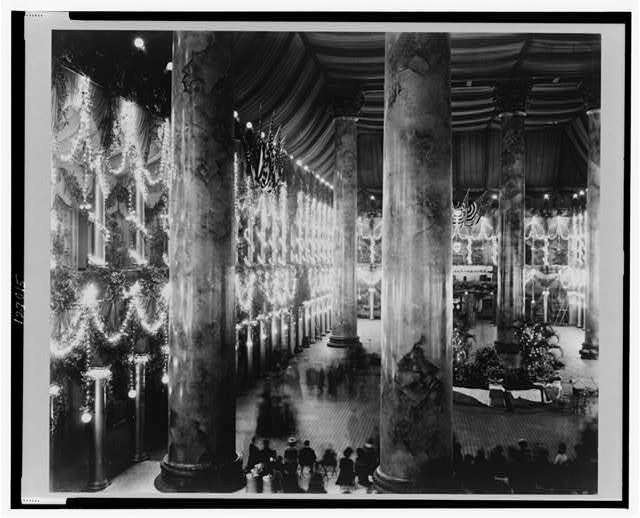 It was the one-hundredth anniversary of the first inaugural ceremonies to take place in Washington City, and the ball’s organizing committee intended to make it the most spectacular of any. The official souvenir program they got up preserves the essence of what they wanted to achieve. With each recurring inauguration of a President of the United States the festivities in which the people of the nation join are carried out on an ever increasing scale of elaborateness and grandeur. This year, as on several occasions in the past, the inaugural ball will be held . . . in the Pension Office building. . . . The magnificent court of this immense building affords suitable accommodations for the thousands who gather to make notable this great social feature of the induction of a Chief Executive into an office, which is the highest a republic can give. The inaugural ball is a time-honored and always enjoyable function. The newly announced President attends with the members of his personal and official family, and leads the opening grand march. It forms a fitting and spectacular climax to a day of so much importance to the whole people. It is confidently expected that the ball this year will be the most resplendent, the most inspiring scene of gayety that has yet marked an inauguration. Over $18,000 has been spent alone in decorations, bunting, electricity, and flowers being the component parts of a scheme, which surpasses in glory of embellishment and detail the dreams of Oriental royalty. The general color effect will be a most delicate shade of yellow known as old ivory. The ceiling will be a canopy of gracefully looped bunting, studded with innumerable incandescent lights burning within frosted glass. There will be no glare of dazzling arc lights, but an artistic mellow glow from the incandescent bulbs. The balconies which surround the court, the grand columns that reach from the tiled floor to arching roof, will all be decorated lavishly by the most skilled artisans. . . . This year American Beauty roses, rare orchids, and thousands of yards of twining vines . . . form the basis of the floral scheme. The US Marine Band was slated to play a special program of promenades. A 125-piece orchestra was also on hand to play dance music throughout the night. Admission to the ball was $5 a ticket, while tickets to the buffet were an additional $1 each. On arriving, President McKinley and his family, and Vice President Theodore Roosevelt and his family, were first shown to private suites of rooms off the Great Hall before emerging to lead the grand opening march. President McKinley and his wife Ida were admirable figures, but the night really belonged to the new vice-president Teddy Roosevelt and his wife Ethel, whose youth and glamor threatened to eclipse the president entirely. Roosevelt’s reputation as heroic leader of the ‘Rough Riders’ who helped liberate Cuba from Spain had endowed him with universal celebrity. His very presence reminded everyone of the nation’s recent military triumph, further stoking the celebratory mood of the ball that night. Image by noted photographer Frances Benjamin Johnston. Among the hundreds of historical photographs I’ve looked at this week, this one stands out, jarring my sensibilities, its everydayness so strikingly at odds with ours. Whereas many historical photographs appeal because of their near-resemblance to the life we know, others are fascinating in their strangeness, in their capacity to demand independent consideration. So it is with this photograph from the National Library of Ireland. 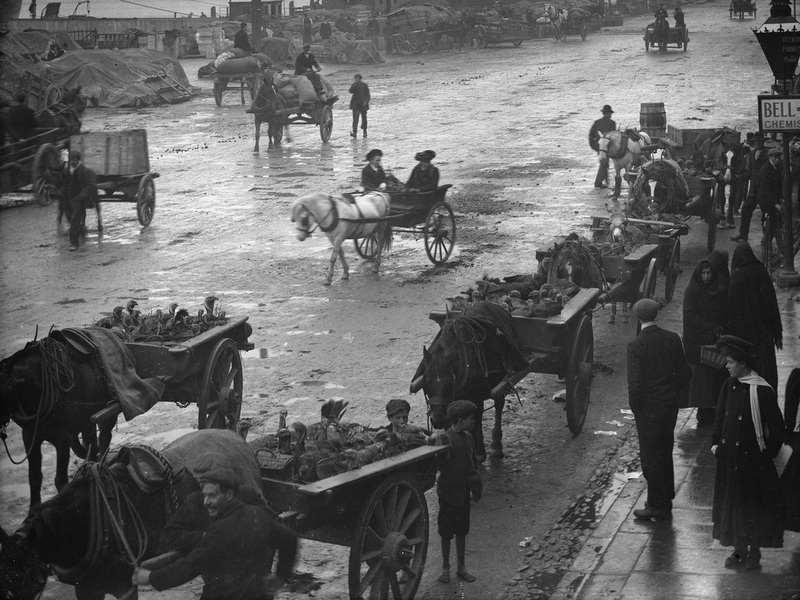 It shows a muddy street in the port city of Waterford, where teamsters are conveying several carts of live turkeys up from the wharves. Their destination may be a local poultry store, where the turkeys were likely to be sold to customers live, then kept at home and butchered by those in the kitchen for the holiday meal. The date is December 16, 1907. To have a rich turkey feast was then, as in Dickens’ time sixty years earlier, a singular joy and a sure token of prosperity. There was a different appearance to a street. The bricks of the gutter are evident, but the rest of the paving is scarcely visible beneath a thick layer of mud and animal waste, which night crews may have periodically combed smooth. The only conveyances in sight are carts and wagons, though elsewhere, we know, automobiles were beginning to appear. Besides teamsters hauling goods away from the harbor, the only other traffic is a pair of ladies in decent hats, driving themselves on their calls and errands. The real point of interest, though, is along the curb, where we see a barefoot boy standing in the road. He and his friend may be hoping to earn a few coins by helping the teamsters unload the turkeys. Just a few feet away are a well-dressed lady and gentleman, and behind them are a trio of poorer, working-class women known as ‘shawlies.’ Whereas the lady has a proper overcoat or wrapper and a fur hat, the other women go about with their heads and bodies unceremoniously wrapped in shawls for warmth. They carry baskets. Class was different then, as clothing and shoes and manners marked out very visibly just how different one type of person was from the other. Though the classes rubbed elbows much more intimately than they do today, the gulf between rich and poor was more evident and less was done to ameliorate it, to ease the suffering of the barefoot and hungry. US postal carriers circa 1910, with the holiday mail. Then, as now, they hold it all together. 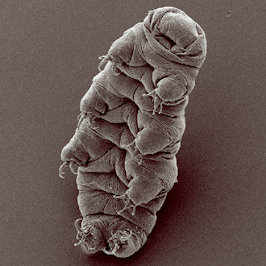 E.B. Thompson was a successful photographer active in Washington DC in the early decades of the 20th century. Thompson, who was probably born around the time of the Civil War, gained prominence around the same time as Theodore Roosevelt; indeed, the Rough Rider may have been Thompson’s chief patron. 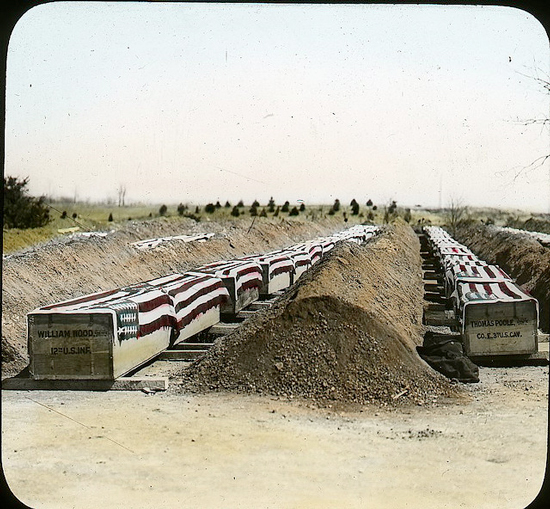 Readers may recall reading this post about Thompson’s 1899 photograph of the coffins of American war dead awaiting burial at Arlington Cemetery. Besides documenting the political scene, Thompson created and preserved many other pictures—photographs and stereographs—of everyday life in the District and other subjects of local and personal appeal. Among them was this picture of a turn-of-the-century open-air market, taken around Christmastime, as you can see. Evidence internal to the photograph (such as the clothing and shutter speed) suggests it was taken no earlier than 1905. 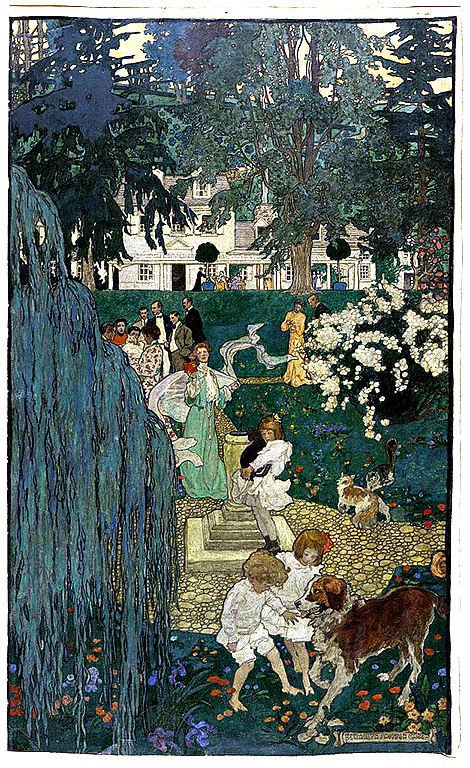 Prints of the original image were then colorized for sale. The color does a lot to draw us back into that earlier time. 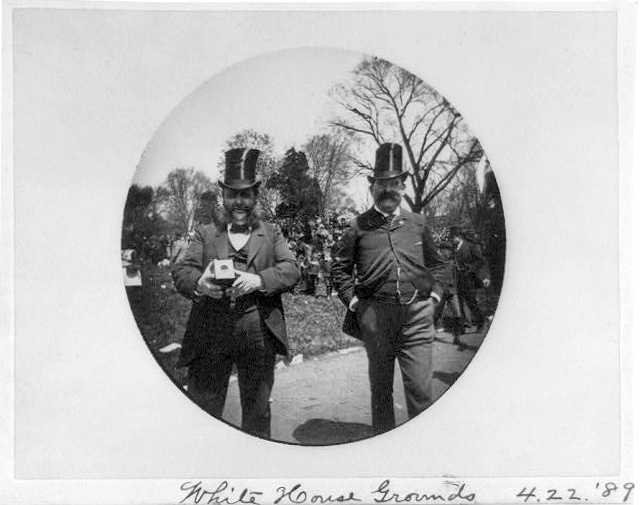 On April 6, 1899, Washington DC photographer E. B. Thompson rode out to the cemetery at Arlington, where the remains of several hundred officers and soldiers were about to be buried. The men had died in the late war with Spain, a brief affair that both began and ended the previous year, bringing the US control of Spain’s former island possessions—Guam, Puerto Rico, and the Philippines—and the independence of Cuba. The coffins represented a fraction of the 3,000 Americans who died, felled not so much by their adversaries as by tropical diseases like malaria and yellow fever. Now, belatedly, they were to be buried. The coffins lay suspended over long trenches dug in a new section of the cemetery. Many of the remains were unidentified, so coffins of the known dead were carefully positioned at the ends of the rows that would be most visible during the ceremony. 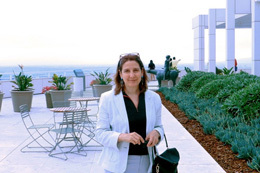 Thompson positioned himself near the presidential viewing stand and took this picture. It is an image as raw as the landscape itself, the kind of grim tribute to the fallen that we hardly ever see. It was colorized later. A crowd of some 15,000 people, along with President McKinley and other dignitaries, gathered for the funeral rites. A newspaper in New Brunswick, Canada, carried a full account of the proceedings. The work of burying the coffins began after the crowd dissipated, a tough, tedious job that took several days. Image: E.B. Thompson photograph, “Interment at Arlington National Cemetery,” 1899. Courtesy DC Public Library Commons, from this source. I spend a lot of time looking at old photographs, often when I’m having trouble writing, when I’m tired or don’t know what else to do. Historians struggle with the relative invisibility of the topics they write about; that’s why it’s so nice when there are visual vestiges. They feed and correct the imagination, and if you’re clever you can take what you see and use it to write more vividly. Photographs also prompt discovery. 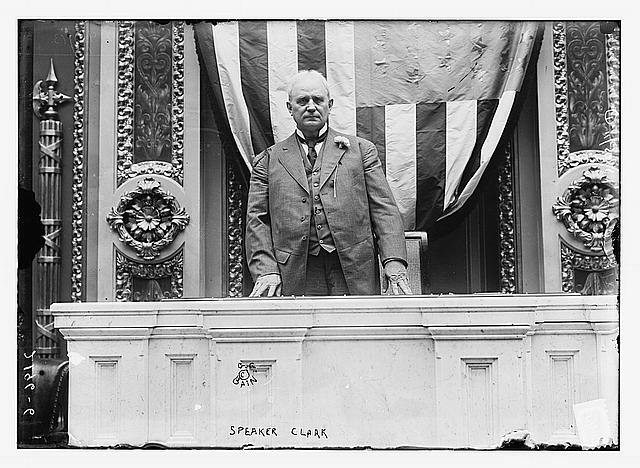 I love this picture of James Beauchamp Clark, a Speaker of the House I’d never heard of before. Not just because it’s a well-composed photograph, with the vantage conveying its subject’s power; I love its realism, the way it’s slightly tattered, used-up, off-kilter. Politics back then lacked the cosmetics of today. Clark (1850-1921) was a Democrat, a contemporary and sometime rival of Woodrow Wilson, with whom he is pictured below. According to a sketch by Lewis Gould in the American National Biography, Clark was born in Kentucky, the son of a traveling dentist and buggy-maker. He received scant education but nonetheless became a schoolteacher at age 15. Later matriculating to Transylvania University (in KY) he got expelled for shooting a gun at another student. Back in school (law school, by this time), he shortened his name to Champ Clark because it would better fit in a newspaper headline. These were just his beginnings. 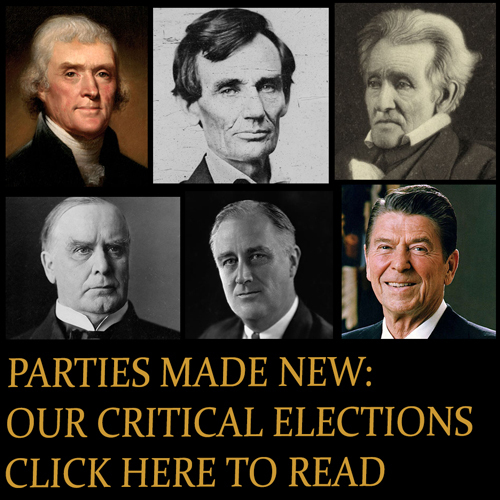 He moved to Missouri and gradually became a power in the Democratic party as it struggled to regain supremacy after the glory years of Republican reign under McKinley, Teddy Roosevelt, and Taft. Clark was more peaceful and anti-imperial than Wilson. I love this “casual” photograph of the two men together, don’t you? 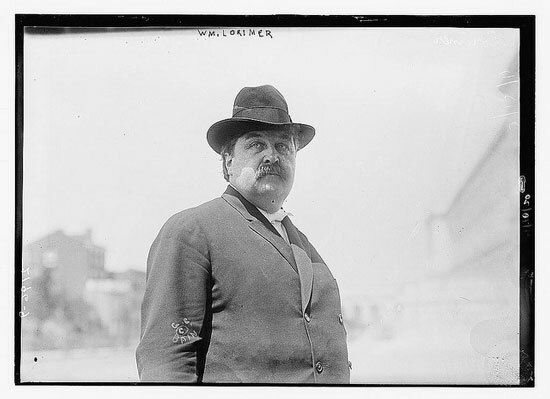 Top: House Speaker James Beauchamp Clark in 1911, from this source. 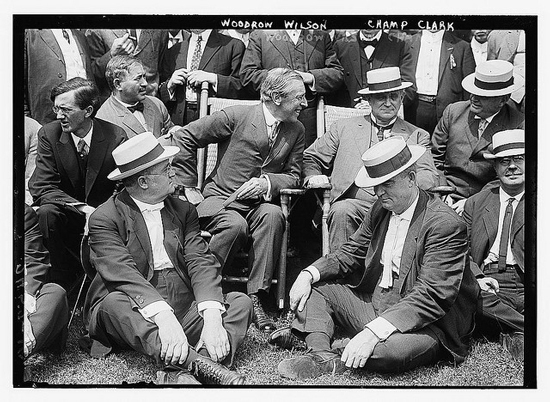 Bottom: Woodrow Wilson and Champ Clark, from this source.